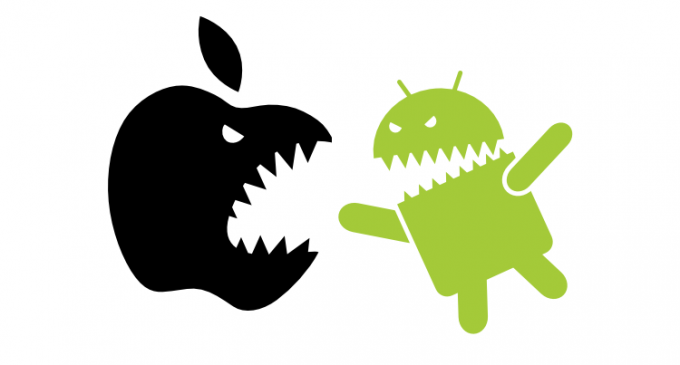 Settling the score: Apple or Android – let’s square off! The battle between the kingpins of smartphone technology rages. Which side are you on and why? Are driven by personal preference or the voice of the crowd? Why choose one over the other? And lastly, why do you care? Today we will settle the score between Apple’s iPhone 6s and Samsung’s Galaxy S6. As seen above, the dimensions of iPhone 6s are 5.44 by .64 by .28 inches with a weight of 5.4 ounces, Samsung 6S on the other hand has a bit bigger screen with dimensions of 5.65 by 2.78 by .2 inches, and is lighter at 4.87 ounces with a slightly thinner body. Display quality wise, the Galaxy S6 is the obvious winner. The device sports a 5.1-inch Quad HD Super AMOLED (tis’ a bit mouthful, huh?) display covered with Corning Gorilla Glass 4 and boasts a resolution of 2,560 by 1,440 and 577ppi to boot. However, that doesn’t mean that iPhone 6S’ display is inferior – the 4.7-inch Retina HD screen with 1,334 by 750-pixel resolution at 326ppi is a whole lot better than the one on the iPhone 6. And well, Apple also launched forced (aka 3D) touch with the 6S, allowing the iPhone to distinguish force and perform actions like Peek and Pop to view content. Ka-cheeka! *It’s the sound shutters make, if you must know. In regards to the camera, the iPhone 6S sports a 12-megapixel rear-facing camera with f/2.2 aperture, 4K video recording, and a True Tone Flash, as well as a 5-megapixel, front-facing camera. The Galaxy S6 however, has more raw megapixels in its rear-facing camera at 16-megapixels with optical image stabilization. In true test, however, both shoots awesome photos that are a beauty to see. Under the hood. This is where we square off. All the big changes to the iPhone 6s are found in its new hardware. It now runs a 64-bit Apple A9 processor, while the S6 has Samsung’s 64-bit Exynos 7420 chipset. The Galaxy 6s has 3GB of RAM, compared with iPhone 6S’ 2GB – which, as you know, doesn’t accurately measure how speedy the unit is. You must use it to see the actual difference. When it comes down to it, both of these flagships are THE BEST in their respective fields. The choice is actually up to the user. So, are you an Apple guy? Or an Android guy? Already itching to get your hands on either of these two? How about combining it with easy installment that comes and data plan? Cell phone shop like iiNet offers both of these handsets at plans you can’t refuse.